This weekend marked 3 years since the first post on Litemind! To celebrate the date, I have a special treat for you. For the past few days I have been talking to many fellow personal development bloggers… Many of them, in addition to their blogs’ free articles, also sell ebooks with premium content. These ebooks are great and well worth the money (as their customers can attest) — and today you have the chance to get them for free! Yes, each of these authors agreed to give away copies of their ebooks to a few lucky Litemind readers! And it’s really easy to join and participate. 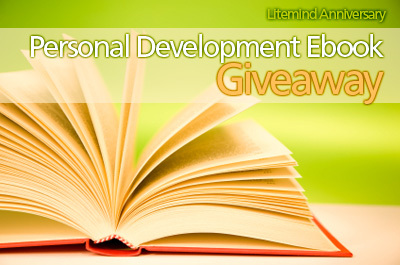 Here is the list of personal development ebooks, in random order, for you to choose. The descriptions were provided by their authors. Many of the ebooks have free chapter previews, so make sure you visit the links to get more details. Anyway, make your choices, pick the three you like best and let me know in the comments below. Are you in need of a motivational boost? The Essential Motivation Handbook was created to address those everyday motivation, productivity and self-improvement issues that seem to plague so many of us. You can use this ebook as a handy reference any time you need motivation and as an easy way to find dozens of great motivation tips without having to spend time searching for them online and filtering out the useless stuff. Do you have a habit you would like to change? This book is about learning the right strategies so you don’t need to constantly rely on willpower. Exercising, quitting television, cutting down e-mail, waking up earlier — which are normally painful and long processes. By practicing the right techniques you can learn how to do it with far less pain and much better results. Imagine waking up each morning to a life that’s centered around your life goals, instead of trying to fit what’s most important to you into the nooks and crannies. How To Live Your Best Life – The Essential Guide for Creating and Achieving Your Life List will show you how. By the time you finish reading this ebook you’ll know exactly what you want in each area of your life, and you’ll have defined exactly how you’re going to get it. The fastest way to go broke is to spend on the things that you don’t love. In a society that had taught us to have more of everything — from junk to spending on the unnecessary — how can one go from funding dreams with debt to becoming debt-free, ending the addiction of overconsumption and start living again? Doing With Less is written to guide you to make changes in your live, bringing out the minimalist in you, and making you thrive with less in a rush-rush society. Regain Your Balance is designed to help you get back in control of your life. Tackling six key areas – your time, creativity, focus, environment, recharging, and money – it’s packed with motivation, ideas and tips to help you find your balance again. With bonus worksheets and a two-minute questionnaire to get you started, you’ll feel calmer — and on top of things — straight away. The Myers-Briggs Type Indicator is the most popular personality assessment in the world. While simple on the surface, one’s four-letter type offers amazing insight into their personality. Solve the personality puzzle, and get a much deeper look into yourself and everyone you meet. Whether you’re a type theory newbie or a die-hard typewatcher, this ebook will give you a fresh and entertaining perspective on how to enjoy better relationships and a better life. The Power of Positivity contains 22 chapters where we explore the tips and strategies that can help you to greatly improve your life in areas such as weight loss, confidence, social skills, productivity, self esteem and attitude. It’s a constructive and practical guide to living a more positive, happy and successful life. The Personal Excellence Book is your essential handbook to help you live life to your best. 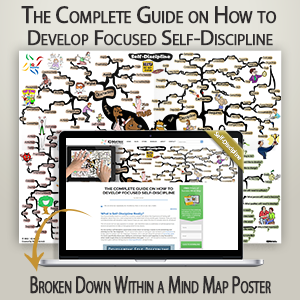 At nearly 800 pages long, it contains 120 in-depth, self-exploratory articles and exercises. Covering 9 key categories of personal growth — including Purpose & Meaning, Goals and Success, Cultivating Habits, Emotional Mastery, Relationships, Productivity and more — The Personal Excellence Book is a one-stop guide if you’re serious about living a life of your highest meaning and potential. Passionate Living is a simple guide to getting you started on following your passion. There comes a time in each of our lives when we need to stop squandering our potential and start doing what we truly love. Passionate Living is a book filled with my personal experiences on how to make that happen. It’s a simple and effective guide that deals with aspects ranging from fear and the lack of time to the specific steps I took to get to where I am now. The Art of Being Minimalist teaches you how to apply simplicity in your life to achieve your goals. Last year I quit my job, moved across the country with everything in my backpack and $3,000 in the bank — everyone said I’d starve, but instead I opted to live a minimalist life. This is what I learned: when you don’t have all of the junk, you can achieve the important. What if I told you everything you know about how to learn, study and succeed in school was wrong? Through researching speed learners, school experts and pinpointing the hidden weaknesses most students face, I’ve been able to come up with my own system — holistic learning. Holistic learning is the opposite of rote memorization. Instead of trying to pound information into your skull, you can weave it into existing understandings. By using these strategies you can actually “get” any subject you want to study. How to Be More Creative – A Handbook for Alchemists is your guide to leading a more creative, inspired life. It shows that creativity is not the sole domain of the arts, but is important in any field. The purpose of this ebook is not just to give you information, but to transform you into a more creative and innovative person. Get practical advice on how to be more creative in every life endeavor. PS2: I’d like to spread the word to as many people as possible about this giveaway. So, if you’re feeling particularly generous, I would be very grateful if you tweeted it or shared it with your friends on Facebook (buttons right below). Thanks!